Anyways, i must admit that in the last few weeks of rehearsing i am not actually focused because i am prioritizing my studies rather than this, now, that the last days of rehearsing is coming i will put this on the top of my priority!. Loosing? for me it's fine but competing is not about self-dreams or self-fulfillment. On September 16 2010, all of the athletes and Buprisans of STI College-Meycauayan will compete, we will be named STI and not ourselves, we will be holding our school's name. I am pressured. Inspired. Love to feel the competition cause it's what i love to do and forte (sabi ni nicxter rather than engineering daw-----pang public speaking.) but most especially I'll do this cause of the budget that our school given to us (haha, dahil lang pala sa budget? 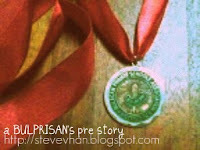 ), for all the efforts and beliefs my school gave and most especially because of my coach. Yes you are my inspiration, thanks for always smiling whenever i loose, and you just simply say "Bawi tayo next year!". I have to cut this now. I am pretty emo now!. I'll tell you what happened after the compe!. Pray for me to win and to all of my fellow BULPRISANS. (sayang ang jersey nila at budget pag natalo!haha, napaka ko!). Go team Meycauayan. Go STI! Title: Facing tomorrow with confidence, strength & character. BULPRISANS do not recite from script but speak of ideas with fervor, BULPRISAN athletes do not move mechanically within an arena but play the game with a spirited heart, and when a BULPRISAN recites a poem, or sings a song, you do not only hear talent you feel his soul!. PS. That's actually my favorite part in the piece cause i feel that it's me---they feel my soul!. My coach made that, partida, my sakit pa siya niyan!. Basta balitaan mo kami about it! hoping this time you'll win! Being a representative from the school is already a winner...Wish you all the best and luck! Winning is not everything but participating gives you more pleasures..go for it good luck..
Steve, winning is never our first objective. It's about doing what we do as best as we can (though you got to agree that doing your best increases your chances at winning :-). Enough talk about all your misadventures. They are there for a purpose - to make you the person you are. Fearless forecast: Tomorrow, I know you'll do great and you'll make mama proud (ako yun hehehe). Go, steve! Go STI Cultural Syndicate ...este... Team pala. Yea my poem was about love. who knows this year might be your year. God bless. Yes! "Loosing? for me it's fine but competing is not about self-dreams or self-fulfillment. " that's right, you go girl! Pray you might win :) and AJA! Never say never > Yuck JB!